The fold-out top in bookmatched veneer, featherbanded & crossbanded. Supported on small lopers flanking the upper drawer. 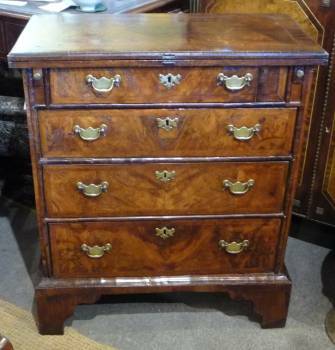 The graduated drawers veneered in attractive burl with featherbanding. Drawers edged with half-round mouldings. Standing on bracket feet. H: 29 1/2" D: 13 5/8" Cabinet width: 24"